Better than a box of chocolates, this dessert is triply indulgent. The cocoa shell forms a crisp rectangular foundation for two amazing fillings. 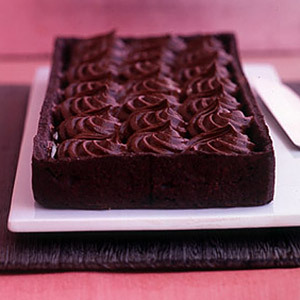 creamy, tangy mascarpone cheese and generous rosettes of silky-smooth espresso-flavored chocolate ganache. 1. Make the ganache: Put chocolate into a medium heatproof bowl, and set aside. Bring cream and espresso to a boil in a small pan. Pour through a fine sieve over the chocolate; discard solids. Let stand 2 minutes, then whisk until smooth. Let cool to room temperature, 1 to 2 hours. 2. Make the tart shell: Sift flour, salt, and cocoa powder into a medium bowl; set aside. Put butter and sugar into the bowl of an electric mixer fitted with the paddle attachment; mix on medium speed until pale and fluffy, about 4 minutes. Add egg and vanilla, and mix until combined, scraping down sides of bowl as needed. Reduce speed to low. Gradually add the flour mixture in 3 batches, alternating with the cream. Shape dough into a thick rectangle; wrap in plastic. Refrigerate until cold, about 30 minutes. 3. Preheat oven to 350 degrees. Roll out dough between 2 pieces of lightly floured parchment paper to a 16-by-6-inch rectangle, about 1/4 inch thick. Press dough into a 14-by-4 1/2-inch rectangular flan frame set on a baking sheet lined with parchment. Trim dough flush with top edge. Prick all over bottom of shell with a fork. Bake until firm, 18 to 20 minutes. Transfer to a wire rack; let cool completely. Unmold. 4. Put ganache into the bowl of an electric mixer fitted with the whisk attachment; beat on medium-high speed until soft peaks form, about 4 minutes. Transfer to a pastry bag fitted with a large star tip (such as Ateco No. 828). 5. Smooth mascarpone cheese over bottom of tart shell with an offset spatula. 6. Pipe ganache rosettes, one next to the other, on top of mascarpone to cover. Store in the refrigerator up to 1 day. NOTE: To turn out smooth ganache every time, make sure the mixture is at room temperature before whipping. Any warmer or colder, and its cream is likely to seize or become grainy. Enjoy! Thanks for the visit. As we know, chocolate is not part of the holiday season, so seeing this recipe is a refreshing moment. 😉 … Best of holiday wishes to you and all those around you – and thanks for the goodness you share with the global community right here.